First up are some delicious fried brussel sprouts with parmesan cheese, shallots and lemon. It’s pretty widely known around Vancouver that the Glowbal Group does some of the best brussel sprouts in town but these ones are easily on par with theirs and they’re priced very well. Just $7 for a good portion where Glowbal’s come in at $6.75 for a much smaller portion. 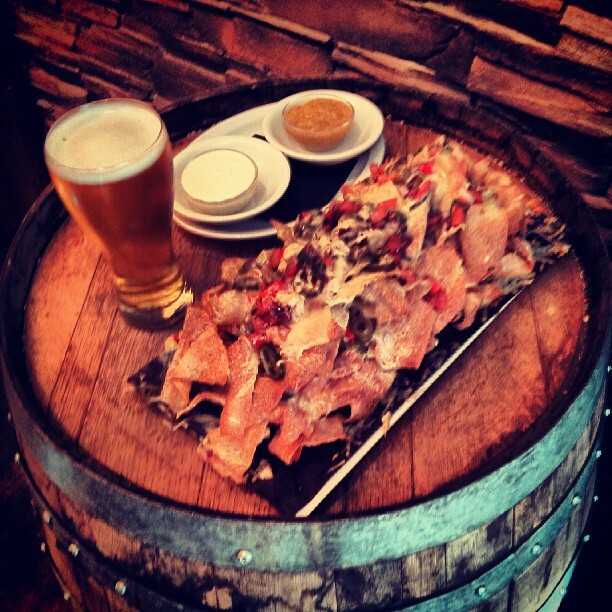 Next up was a really cool twist on a classic pub dish, nachos. 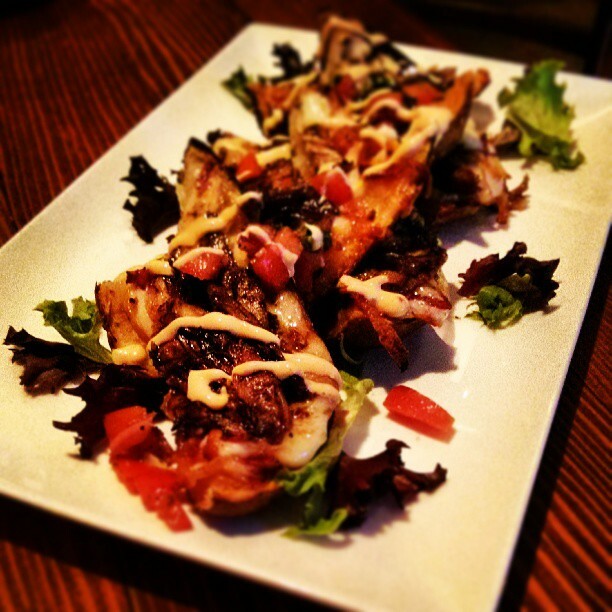 Mr. Brownstone’s are made with crispy fried wontons in place of tortilla chips. They’re topped with tomatoes, green olives, jalapenos and a nice mix of rich cheeses. The wontons are amazing in place of boring old chips. They have a great crunch and a lighter feel and stay crisp for longer. They come with tomatillo salsa and wasabi sour cream on the side. The wasabi sour cream is awesome, just enough wasabi to impart a slight heat and flavour that balances perfectly with the creamy, cool sour cream. Great dish. 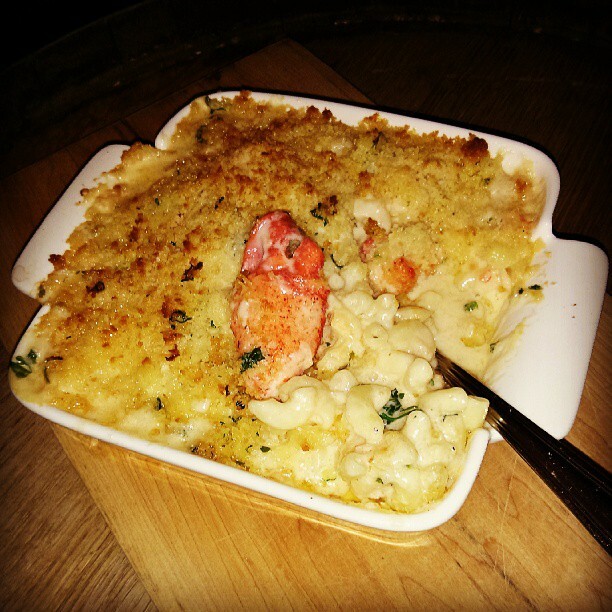 The third dish I sampled was their lobster mac and cheese. I always cringe when I see lobster mac and cheese on a menu because it’s usually made with a product called “Lobster Delight” which is made from Surimi (ground fish, usually pollock) and is artificially flavoured like lobster. This dish has NO FAKE LOBSTER!! Huge chunks of real lobster are abundant and border on excessive, which is a good thing when you’re talking about lobster. Simple flavours, butter, garlic, cheese and lobster all work in perfect harmony here. Rich, decadent and addictive. Your friends will want to try this, tell them to order their own. Did I mention it’s just $18? A total steal for this much lobster and this big of a portion. Next up they brought out some duck confit potato skins. Oh man, you guys see what’s happening here right? This place is doing comfort food right. These potato skins were so good. A good amount of duck confit with applewood smoked bacon, smoked provolone cheese, 40 Creek BBQ sauce, scallions and chipotle sour cream on russet potatoes. Another comfort food classic done up for the big city. Amazing. You guys know where the best burger in town is. I’ve shouted it from the mountain tops for a few years now, it’s at Uli’s in White Rock. The burger at Mr. Brownstone is almost as good but it’s so different than Uli’s it’s a little unfair to compare the 2. This behemoth features a fresh ground chuck patty cooked medium (perfect), Montreal style smoked brisket, a fried egg, sauteed mushrooms, an onion ring, smoked provolone and caramelized onions on a fresh toasted bun with L/T/M (you can figure that out, right?) and some hamburger relish type sauce. 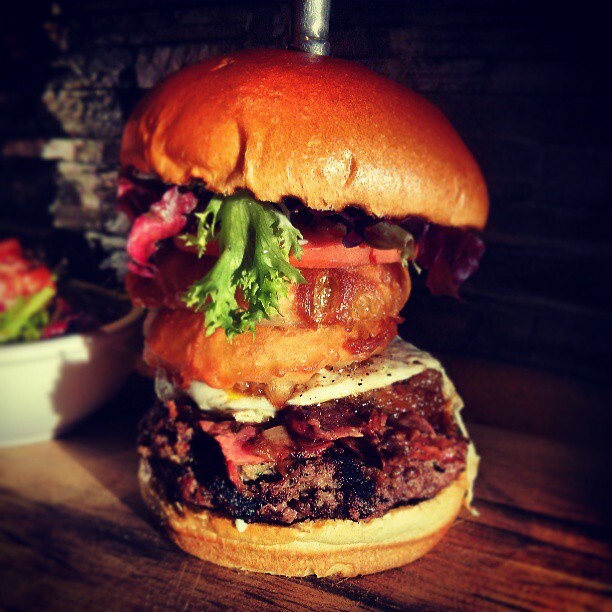 Standing about 10 inches high and held together with a steak knife this burger is a towering monster of deliciousness. The price? Just $15. If you’re keeping track this is course number six, a delightfully rich and sweet dish that is a meal all on its own. 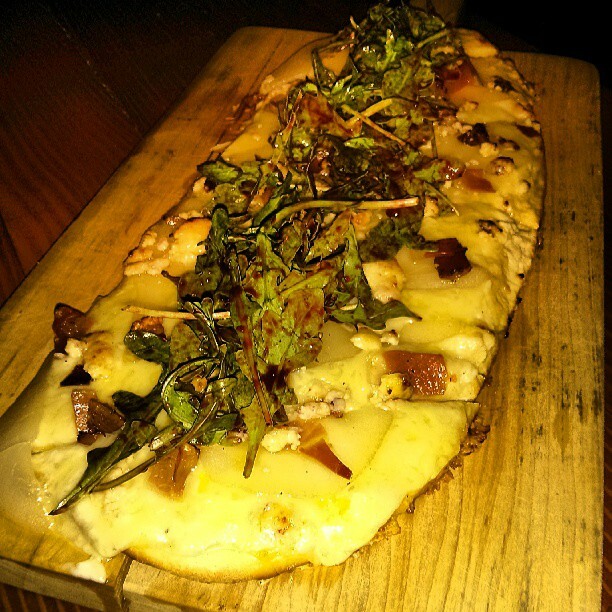 Tangy Stilton cheese, pear slices, crispy prosciutto ( I think, my note taking got a little fuzzy at this point) on fresh baked flatbread. Simply delicious. 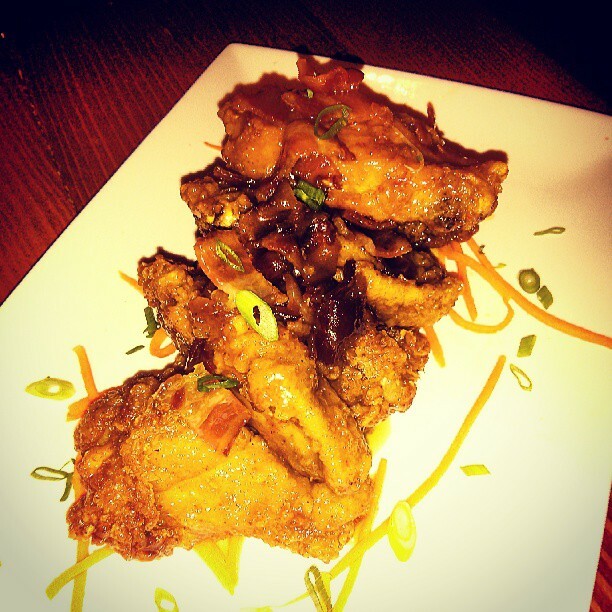 Ok you guys, this is the one most of you asked about when I posted this picture on Instagram/Twitter/Facebook, The maple bacon caramel chicken wings. They sound crazy, like the kind of crazy that would get you locked up for life in some shady parts of the world. In the middle ages you would’ve be branded a witch for even suggesting that this dish sounded tasty. Guess what, these wings are crazy, CRAZY good. If these guys used this recipe on chicken for chicken and waffles they’d easily be the best in the city. 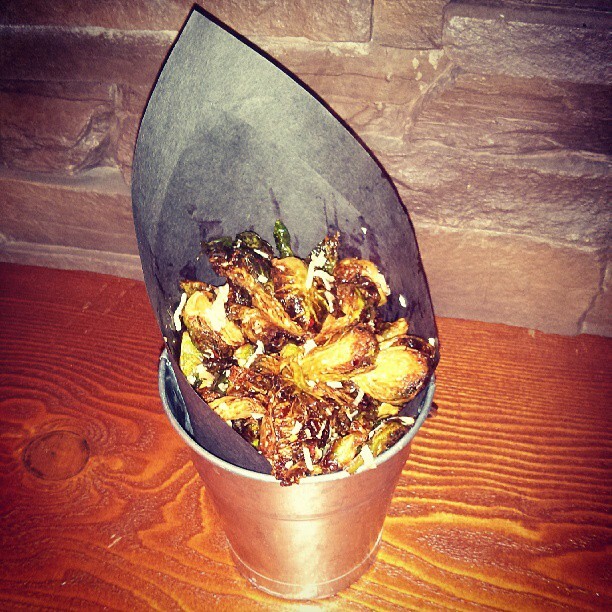 Think of these wings as dessert, made of meat. Everything you love about “Maple Bacon” flavoured things kicked up with caramel and tossed lovingly with deep fried wings. You simply have to try these. So there you have it, Great food and nothing over $20. 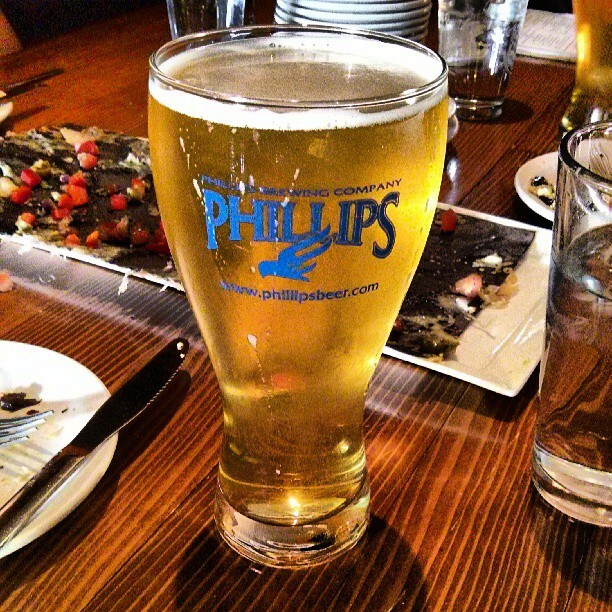 Solid craft beer on tap from Phillips, Odin, Alameda and others. BC wine on tap including one of my favourites, Blasted Church Hatfield’s Fuse. I’ll be back soon, I need those wings in my life. Legal mumbo jumbo – My food was provided by Mr. Brownstone for review purposes. It’s Star Wars day! My gift to you. Target has come to BC! Does it live up to the hype?